Songs by Tchaikovsky, Rachmaninov arranged for soprano and trio. Ансамбль"Gamma Majoris" - РОМАНСЫ РАХМАНИНОВА И ЧАЙКОВСКОГО для голоса и трио. After the huge success of their first CD launch concert at Pushkin House, Gamma Majoris is delighted to be back for the second concert of the 'Russian Serenade' CD presentation series. You will hear most wonderful songs by Rachmaninov and Tchaikovsky arranged for soprano and piano trio by Gamma Majoris. 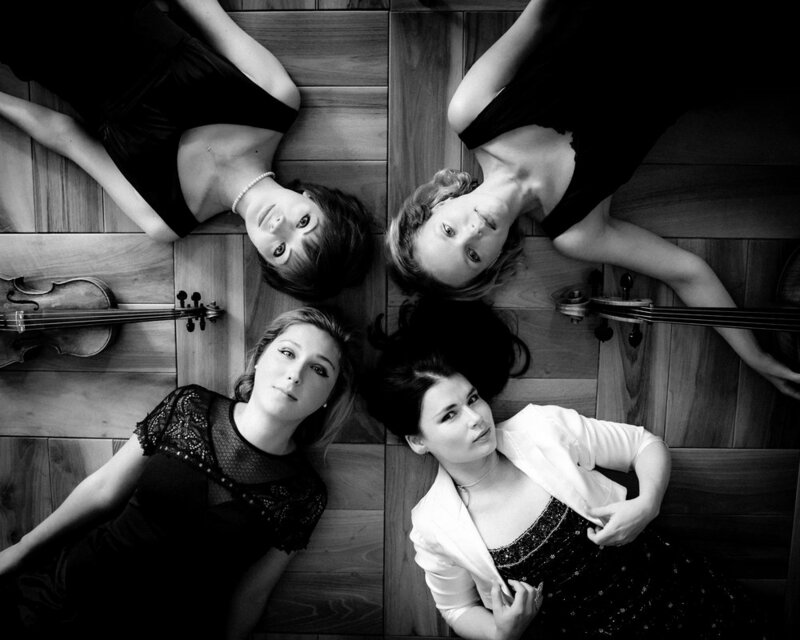 Quartet - Anastasia Prokofieva, Ksenia Berezina, Alisa Liubarskaya, Yulia Chaplina. Gamma Majoris is a London-based ensemble whose concert programmes showcase the individual and combined talents of four established soloists to present classical music in a new way. The ensemble’s name derives from the star Gamma Ursae Majoris and is also the term for ‘major scale’ in Russian (гамма – scale, мажор – major). Anastasia Prokofieva (soprano) has performed operatic roles including Violetta (La Traviata) in Moscow; Countess (Le Nozze di Figaro), Despina (Così Fan Tutte) and Tatiana (Eugene Onegin) in London. She has sung with a wide variety of orchestras and worked with famous conductors such as Gennadi Rozhdestvensky, MichaelRosewell and Volodimir Sirenko. She has Masters degrees from Moscow Tchaikovsky Conservatory and the Royal College of Music. Anastasia recently recorded her second CD, ‘Russian Heroines’, with Kiev’s National Philharmonic Orchestra. Yulia Chaplina (piano) won First Prize and the Gold Medal in the prestigious Tchaikovsky International Competition for Junior Musicians in 2004, going on to perform regularly as a soloist in many of the world’s finest venues, including Wigmore Hall in London, Berlin’s Philharmonie, the Grand Halls of the Moscow Conservatory and the St. Petersburg Philharmonia, Bunka Kaikan Hall in Tokyo and many other prestigious concert halls. Her solo CD of Russian Music was recordedby Champs Hill Records in the UK in May 2014. The American Record Guide described this as “....an outstanding disc and one I’ll return to often.” Yulia holds a Bachelor’s degree from the University of Arts in Berlin as well as a Masters in Music and Fellowship from the Royal College of Music. Ksenia Berezina (violin) is a guest violinist with some of the most prestigious orchestras in the world, including the Orchestra of the Royal Opera House at Covent Garden, London Philharmonic Orchestra and the London Chamber Orchestra. As a soloist, Ksenia has performed with the Southbank Sinfonia and London Chamber Players and given numerous solo recitals around Europe. She studied at the MoscowTchaikovsky Conservatory and the Royal College of Music. Alisa Liubarskaya (cello) is a guest cellist at venues including the Orchestra of the Royal Opera House at Covent Garden, Birmingham Royal Ballet Sinfonia, Orchestra of the Scottish Opera, Southbank Sinfonia and Orchestra of the Welsh National Opera. She has won prizes at the Heran, Beethoven and Chandos International competitions.Since 2007 Alisa has been studying in London and has degrees from the Royal College of Music and Trinity Laban Conservatoire. Her most recent performances include solo concerto performances with Southbank Sinfonia, Trinity Laban Sinfonia and Canterbury Symphony Orchestra, as well as chamber music recitals at the Wigmore Hall, Royal Festival Hall and St. John’s Smith Square.